Based on the Enve 2.0 road fork, the new Z400 was made in collaboration with Zinn Cycles to provide a high quality fork for big and tall cyclists. The legs are the same as the ENVE 2.0, but with a 400mm steering tube with a 1.25" taper. We have also added a custom made aluminum insert to replace the ENVE expansion plug and provide extra strength and stiffness to the steering tube, which is necessary for tall cyclists. From Enve's website: "True to ENVE Culture, we first asked the question of, Ã¬How do we use carbon to maximize this part, in this case a road fork?Ã® The engineering answer was to create a fork with no co-molding, bonding, or drilling. 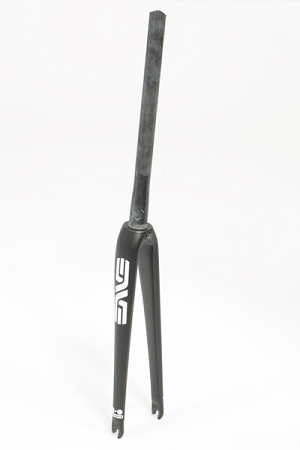 Using a proprietary molding process all ENVE road forks are 100% molded carbon fiber from steerer tube to dropout. Our forks capitalize on unique tooling designs that allow us to create parts that are free of traditional concepts. With this freedom we offer thoughtful, logical improvements to the strength and ride, all at unbelievable weights. Several people have challenged us as to why we make forks when so many frames now come with them, to this we answer . . . ask someone whoÃ­s ridden an ENVE! The cornerstone of the ENVE fork line, the 2.0 is where fork performance starts. Regardless of model or steerer tube configuration everything starts with the 2.0 version. These forks are designed to do everything, and do it well. It starts with the process of finding a functional shape that allows the carbon to be in its best configuration. Next is the refinement of the ride and weight until it is up to ENVE standards. In the end, the standard that we adhere too! So no matter what you are looking for this fork deserves consideration. Whether it is our 1 1/8Ã® standard, 1 ÂºÃ® or 1 Î©Ã® tapered, we have a fork that will meet your needs."